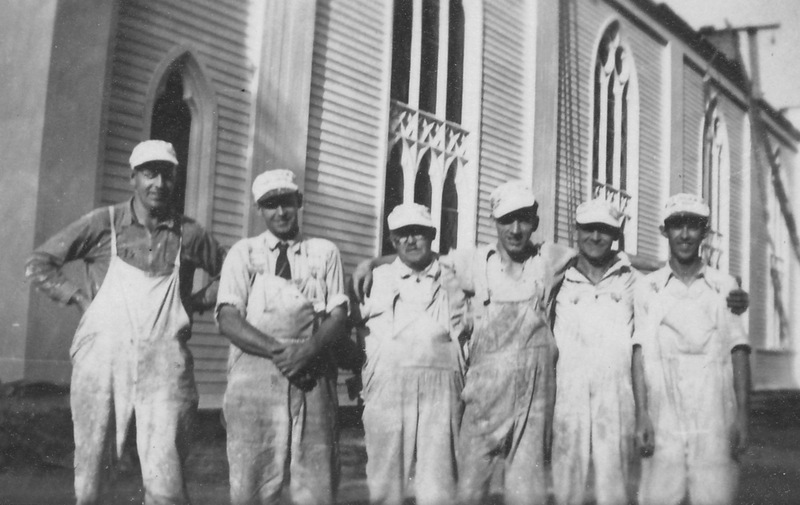 Johnson Brothers painting the Christ Church in Stratford, Connecticut. My grandfather Lawrence (Larry) is 2nd from left. Harold Johnson, his brother, is the far right. Fiction writing technique can easily apply to memoir. All writers seek to write the most compelling story, whether emphasizing character or action, but fiction writers have the flexibility to bend the universe to suit there needs whereas memoir writers are stuck with the (sometimes boring) truth. How can memoir writers discover more exciting ways to tell their story? I’ve been participating in the University of Iowa’s International Writing program for the past six weeks. This week’s lesson focused on a family story–memoir! The weekly 400-word writing assignment required a family story with two alterations. The first alteration required a change in setting, while the second required the introduction of an event that did not happen. I decided to write about my grandfather, and submitted the story below for review. High in the church’s bell tower, Harold feasted on the beauty of his New England hometown: the red and orange autumn leaves layering Main Street, a few shoppers ducking in and out of familiar stores, and the rumble of a few Ford and Chevys bumping along the road. There was no competition for painting church steeples, so Johnson Brothers were regularly contracted to complete the “high jobs” around town. Harold breathed in the cool air as he saw his brother ascending the wooden extension ladder, which was affixed to scaffolding to extend to the bell tower’s height. “Thanks,” said Harold appreciatively. He took the familiar black lunch pail with thermos from his brother, which allowed Larry to use both hands to safely climb over the railing of the bell tower. “Sounds good,” said Harold, still taking in the view. Larry sensed that Harold would eat when he was ready, so climbed back over the railing and started to descend the ladder. He chuckled to himself; amused that Harry hadn’t mentioned the previous night’s dinner conversation. “Why do you peel potatoes?” Harold had asked inquisitively at last night’s dinner. The meat, baked potato, and carrot dinner had not looked right to him after Larry had scraped the potato peels to the side. People were starving during the Depression and potato peels were perfectly edible. Harold always ate the skins. “I don’t like them,” said Larry with a smile. Harold started to needle his brother about the potato peel idiosyncrasy. Close friends, as well as business partners, both men enjoyed teasing one another. “If you like the potato skins so much, I’ll save the peels for you!” declared Larry. The brothers both laughed at the joke. Now, as Larry reached the bottom steps of the ladder, he wondered how Harold would react to his latest prank. Stepping off the last ladder rung onto the scaffolding, he glanced up at the bell tower just in time for the potato peels to hit him squarely in the face. The assignment proved to be great fun! The Iowa team asked…As you write, and afterward, notice what happens to the feel of the events when they take place in a new setting. Notice what happens to the tone and meaning of the entire scene when you change one event within it. Having completed the exercise, I felt that my new fictional story, although based on fact, included more playful elements than I could otherwise have provided by simply reporting the events as they happened. What is actually true in this story? My WWI generation grandfather (Larry) and his brother (Harold) really did paint church steeples, and were the only contractors who would paint the highest buildings (mostly churches) in their New England town. Harold really did tease Larry about not eating potato peels and Larry’s retort is completely true. The rest of the story is fictionalized. I would never use this story in a published memoir, but it sure did get my creative juices flowing. In memoir form, I’d look for a different way to tell the potato peel exchange that added more flare to events. It might be harder to find the right “story,” but a fiction writing class taught me to explore my options. Thank you for this charming story. I knew Mr. Harold Johnson and would like to share some recollections of him with you. « The social media challenge about books!